A newly created partition should be formatted before it can be used to store data. 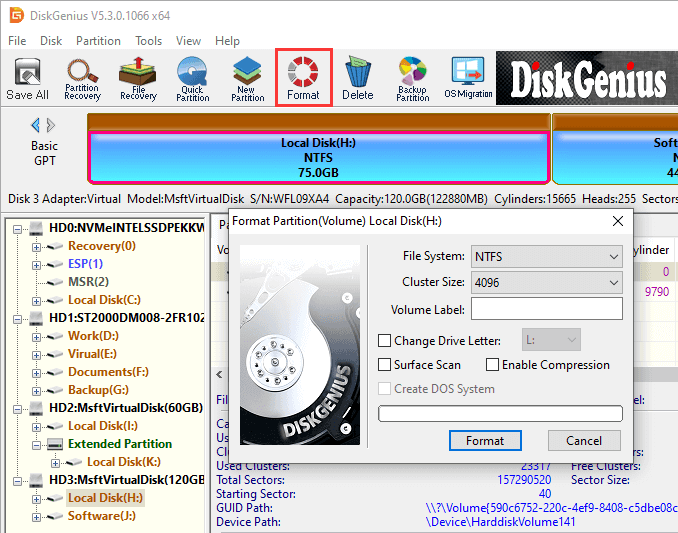 Currently, DiskGenius supports formatting partition to NTFS, FAT32, FAT16, exFAT, EXT2, EXT3 and EXT4 file system. Step 1 Select the partition you want to format and click Format button from toolbar, or right-click on the partition to choose Format Current Partition. Step 2 Select file system, cluster size, volume label and click Format button. Also, you can select "Surface Scan" which will scan the drive for bad sectors during formatting. However, surface scan takes long time and there is no need to do so on most new hard drives. As to NTFS partition, you can select Enable Compression to enable NTFS file system's data compression feature. If the partition to be formatted is primary partition and file system is set as FAT32, FAT16 or FAT12, the option "Create DOS system" will be available. If it is selected, the formatting process will create a DOS system in this partition, which can be used to boot computer. Step 3 Click Yes when DiskGenius asks confirmation for the operation, and the partition will be formatted quickly.